The Obama dictatorship is virtually complete. Since he began the occupation of what was once our White House, the dictator-in-chief has been busy writing one Executive Order after another designed to replace US law…with ObamaLaw. Under normal and saner times, these EOs would mean little-to-nothing because the checks and balances of co-equal branches of government would render them null and void if they flew in the face of Constitutional law. But, today, insanity is reigning supreme. Note: For those of you raised in the government public school systems over the last three decades, the US Congress (which includes the House of Representatives and the Senate) and SCOTUS (the Supreme Court of the United States of America) are co-equal (under the US Constitution) with and to the Executive branch and each of the three branches of the US federal government legally carries 1/3 each of the power to run said government. However, co-equal branches of the US government–like the Bill of Rights for US citizens–are no longer applicable in the USA. They have been replaced by dictatorial rule of and from the US White House; specifically under the now almost complete tyrannical control of Barack Hussein Obama. Why? Because Congress refuses to act and/or follow through on stopping Obama and his demolition-of-America team from destroying the US Constitution, individual rights and SCOTUS is now openly ruling in both bizarre and unconstitutional ways. This abrogation of duty has resulted in the submission of the Legislative and Judicial branches of government to the Executive branch. Question: Are members of Congress and SCOTUS (minus their female members) now required to bow down and pray five times a day in the direction of Washington D.C. to Obama? Does Obama provide the prayer mats? In April 2013, under the NY SAFE (Secure Ammunition & Firearms) Act, Governor Cuomo of New York issued orders revoking permits for legally owned guns and advised the owners that they must surrender those permits and “any and all weapons” over to the police. The persons receiving this mandate are those citizens who are taking anti-anxiety drugs. First, HIPPA (Health Insurance Portability and Accountability Act) laws were broken and the information received about individual prescribed drugs acted upon by NY was obtained illegally and second…the Right to Bear Arms contained in the Second Amendment was (following Obama’s example) thrown onto the street, stomped on and swept into the gutters of New York by another dictatorial Democrat executive. Army Master Sgt. C.J. Grisham, who had previously been honored for his service by President George W. Bush, was arrested while on a 10-mile hike in Texas with his son in March 2013. He was arrested by police (who had apparently been following him) for “rudely displaying” his firearm. Huh? Is this a real law? The rifle was being carried, as the area of the hike contains wild boar, cougars and other potentially dangerous animals. His AR-15 was confiscated. By the way, AR-15 rifles are still legal in all US States. 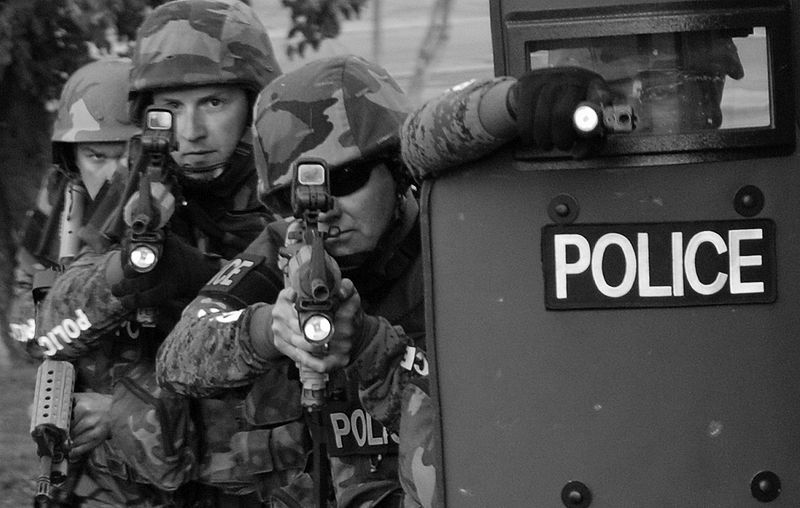 After the Boston Marathon Bombings, multiple reports of house to house forced entry by Boston police and SWAT teams emerged with pictures taken of multiple heavily armed militarized police on the doorsteps of private homes. In one video (below link), the initial knock on the private home door almost knocks it in. Only those who do not have access to communication of any type can possibly not know about what has happened to the IRS. Along with the highly-militarized local police forces, Obama and his syndicate have used the IRS as, yet, another arm of his growing Gestapo. If you are a TEA Party member, Patriot organization, Christian or Jewish group or a group committed to liberty and the preservation of the US Constitution, you have likely been targeted by the now–apparently–all Marxist all the time Internal Revenue Service. The IRS–in what increasingly appears to be getting closer and closer to its orders coming directly from the Oval Office–has been summarily withholding tax exempt status from those groups that oppose Obama’s policies. These group members have also been asked highly-intrusive–and probably illegal–questions by the IRS. If they don’t answer them, the IRS has–also in writing–advised them that they can and/or will be held in contempt and subject to perjury charges. Many of the same groups have waited for years for approval and some are still waiting. However, groups that publicly agree with Obama or have group names indicating they’re on the Left politically have sailed right through and received their tax exempt status. The IRS has actually admitted that it affected the above actions and is still continuing the illegal activities today! In fact, recently the IRS began targeting conservative groups for “audits” and “special attention” which already have tax exempt status. Additionally, the IRS has also finally been caught having leaked information on former Republican (and TEA Party) Delaware Senate candidate Christine O’Donnell’s tax records to the Delaware Democrat Party! These are way beyond dirty-tricks and it should be abundantly clear to any and all with a bit more than a brain stem that Obama has set up and is in the process of using his personal hammer and sickle groups to implement his increasingly violent police state activity. The Iron Curtain encircling the USA is almost fully down. But, even these actions are only the tip of the iceberg. I have never been so afraid for the future of our children. The country has been overtaken by an illegal president, communist activists, and complicit oligarchs in congress. All with the smiling approval of a propaganda machine, formerly known as the American free press. But wen must continue our campaign of truth telling. Thank you for what you do. For me, the scariest part is that I lived through the whole Boston Bombing thing. What a perfect setting to try out your Gestapo. I’m a ER nurse, I work in a Boston trauma center (Brigham and Women’s Hospital), I saw all that mess and dealt with the martial law.. Not only that, the bomber went to university about a ½ mile from my house. I live 50 miles from the bombing but that s*** followed me home. There were road blocks, armed DHS/BATFE/FBI armored cars and armored SUVs everywhere at work AND at the end of my f*****g street… Blackhawk’s hovering over my house, WTF. It’s a whole new world bros, a whole new world. And everyone is just watching this s***! WAKE up Americans! What the hell is wrong with people?Get off your couch and help take back our country! Our military is still fighting for us….Back them up at home! They say to stop 20 million people from leaving the Los Angeles basin, all you need are police to block 7 or 8 freeways leading out of the area, in addition to shutting down all sea and airports. Similarly Ob*ma has all the legal chokepoints covered regarding the checks and balances in our Constitution. Now that California is going to disarm the state citizens, this is what will happen in the near future as in China. Enjoy tyranny California!